Many commercial products enclose or are low percent acid solutions. Vinegar is a water solution that is 4 to 5 percent via weight acetic acid, CH3COOH. Many producers add flavorings and color to make the product sell better. Vinegar is commonly utilized in flavoring and preserving food. This is since the acidity adds 'tang' and inhibits bacterial growth. Any vinegar sample might be utilized, but colorless vinegar is favored since it provides less interference through the examination of the indicator endpoint color change. a. 500 mL plastic bottle. a. 25.00 ml volumetric pipet. 3. Measure exactly 25.00 mL of vinegar into a clean 250.0 mL volumetric flask. As we know that be sure to utilize a dry beaker to transfer the vinegar. Don't put any utilized vinegar back in the vinegar supply. Be sure to rinse our pipette through vinegar prior to using it. 4. Dilute the vinegar with deionized water to the mark on the volumetric flask. 5. Stopper the flask and mix the solution well. (Invert the solution slowly for at least 10 times to completely mix the contents). 6. Transfer the dilute vinegar solution to a clean and dry 500 mL plastic bottle and label it with both the contents and your name. 7. Immediately wash your volumetric flask with plenty of tap water and several portions of deionized water. Let the flask dry at room temperature. 9. Rinse your 25.00 mL volumetric pipet. Several times with portions of diluted vinegar from your beaker. Be careful not accidentally add any water to the diluted vinegar solution in the beaker. 10. Carefully pipet 25.00 mL of diluted vinegar solution into the 250 mL Erlenmeyer flask. 11. Add about 50 mL of deionized water to the Erlenmeyer flask. 12. Add 2 drops of phenolphthalein indicator solution and swirl the flask to thoroughly mix the solution. 13. Rinse your 50 mL buret several times with a few milliliters of your standardized sodium hydroxide solution. 14. Fill the buret with your standardized sodium hydroxide solution. a. Make sure that the tip does not have any air bubbles. b. Record the volume or the buret to the nearest 0.01 mL. 15. Titrate the acid sample to a faint pink end point. 16. Record the final volume of the buret to the nearest 0.01 mL. b. The precision of your data. The molarity of the original vinegar solution can be found by keeping in mind that the vinegar has been diluted ten times (from 25.00 mL to 250.0 mL) to obtain the diluted vinegar, whose molarity has been determined via titration through standardized NaOH. Chromatography is a division and analytical technique widely utilized in chemistry and the biological sciences. Most obviously occurring substances are a mixture of substances that can only be divided or analyzed using any of the techniques recognized. In this chapter we shall not be involved in any practical exercise but rather shall be exposed to the principles of the diverse shapes of chromatography dissimilar. Chromatography, initially initiated via the Russian botanist Micharl Iswett is a process for separating the components of a mixture through differential distribution of the components of the mixture between a stationary phase and a mobile (moving) phase. At first utilized for the division of coloured substances from the plants (Greek, Chromos meaning coloured) are now the most widespread method of separation and purification of coloured/colourless organic compounds. Division of 2 sample components in chromatography is depending on their different distribution between 2 non-miscible phases. The one, the stationary phase, a liquid or solid, is attached in the system. The other, the mobile phase, a fluid, is streaming through the chromatographic system. In gas chromatography the mobile phase is a gas, in liquid chromatography it is a liquid. The molecules of the analytes (mixture to be divided) are dispersed between the mobile and the stationary phase. When present in the stationary phase, they are preserved, and aren't moving through the system. In contrast, they migrate through the velocity, v, of the mobile phase when being there. Due to the different distribution of the particular analytes the mean residence time in the stationary phase differs, too, consequential in a different net migration velocity. 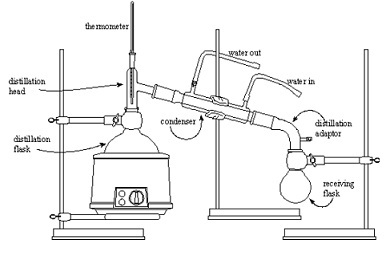 This is the principle of chromatographic separation. Division of 2 sample components in chromatography is depending on their different distribution between 2 non-miscible phases. Paper chromatography is one of the most general kinds of chromatography in that filter paper provides as a support for immobile liquid phase. Removing liquid flows between the fibres of the cellulose but such aren't the stationary phase. The true stationary phase is the extremely thin film of liquid generally water adhering to the surface of the fibers. (Water is absorbed on the fibers/ cellulose via strong hydrogen bonds through - OH of the cellulose). The substrate to be divided is distributed between the 2 liquids, stationary liquid that is held on the fibers of the paper and moving liquid in developing solvent. It utilizes a strip of paper and capillary action is utilized to pull the solvents up through the paper to divide the solutes. A small concentrated spot of solution that encloses the sample is applied to a strip of chromatography paper about 2 cm away from the base of the plate, generally using a capillary tube for maximum precision. This sample is absorbed onto the paper and may form interactions through it. Any substance that reacts or bonds by the paper can't be computed using this technique. The paper is then dipped in to a suitable solvent, these as ethanol or water, taking care that the spot is above the surface of the solvent, and situated in a sealed container. The solvent moves up the paper via capillary action, which take place as a consequence of the attraction of the solvent molecules to the paper as well this, can be clarified as differential absorption of the solute components into the solvent. As the solvent increases through the paper it meets and dissolves the example mixture, which will then travel up the paper with the solvent solute sample. Different compounds in the sample mixture travel at different rates due to differences in solubility in the solvent, and due to differences in their attraction to the fibers in the paper. The components of the mixture move up the paper with the solvent at different rates, Rf, due to their differing interactions by the stationary and mobile phases. The surface of the plate consists of an extremely thin layer of silica gel on a plastic or Aluminium backing. Silica gel is a form of silicon dioxide (silica). Thin layer chromatography is similar to paper chromatography in that it entails spotting the mixture on the plate and the solvent (mobile phase) rises up the plate in the chromatography tank. It has an improvement over paper chromatography in that its separations are extremely efficient since of the much smaller size of the particles in the stationary phase. Gas chromatography and high performance liquid chromatography are more sophisticated chromatographic techniques. Column chromatography is commonly utilized through organic chemists to sanitize liquids (and solids.) An impure example is loaded onto a column of adsorbent, these as silica gel or alumina. An organic solvent or a mixture of solvents (the eluent) flows down through the column. Components of the example divide from each other via dividing between the stationary packing material (silica or alumina) and the mobile elutant. In column chromatography, the stationary phase is packed into a glass tube to form a cylinder or column of granules. Solvent or buffer can flow generously between the granules. Stationary phase might be silica gel or ion exchange resin or a diversity of other substances that might have particular affinity for amino acid molecules. The example is applied through care as a layer on top of the stationary phase. Then solvent is added and flows through the column. Examples molecules shift while they enter the flowing solvent. The stationary phase in polar compounds are attracted to the polar column packing via hydrogen bonding or dipole-dipole attractions The more polar component interacts more powerfully through the stationary phase. Polar compounds are shift gradually. Non-polar compounds are going to come off the column 1st, while the polar compounds are going to come off the column last. Generally, one starts will a less polar solvent to eliminate the less polar compounds, and then gradually amplify the polarity of the solvent to eliminate the more polar compounds. Molecules by diverse polarity partition to different extents, and hence move through the column at different rates. The eluent is gathered in fractions. 1) Pneumatic system -gas provide (flow manage and measurement). 2) Injection system - a heated injector port, where the illustration is vaporized if needed. 3) Column - where the division take places. 4) Oven -The coiled column is wholly contained in a thermostatically controlled oven. 5) Detector - integral detector or link to a mass spectrometer. 1) A carrier gas, examples of which are Helium and Neon flows through the system. A valve controls the flow rate. 2) A example of the volatile mixture is injected into the carrier gas. The sample is vaporized in the heated injector port. 3) The carrier gas carries the vaporized sample into the column. The columns are stainless steel or glass tubes. They can be up to 25 m in length and are of narrow bore (2-10 mm). Therefore the column is often wound into a coil. The packed columns enclose porous hold material. The sample mixture undergoes a series of interactions between the stationary and mobile phases as it is carried through the system via the carrier gas. Due to the wide choice of materials available for the stationary and mobile phases, it is possible to divide molecules that differ only slightly in their physical and chemical properties. 4) The coiled column is enclosed in the thermostatically controlled oven. 5) Separated components merge in the order of rising interaction through the stationary phase. The least retarded component comes through first. Separation is attained when one compound is adequately retarded to stop overlap by another component of the example, as it emerges from the column. 6) Two kinds of detector can be utilized: (1) thermal conductivity detectors that respond to transforms in the thermal conductivity of the gas leaving the column and (2) flame ionisation detection (FID), which is more commonly utilized. In thermal conductivity, as the carrier gas leaves the column, it cools the detector. When a solute emerges through the carrier gas, it doesn't cool the detector to the similar extent. Otherwise, samples can be exceeded from the oven directly into a mass spectrometer, where they are analyzed. a) The nature of and the connections between the solute and the stationary and mobile phases. Once GC has divided a mixture, the components can be recognized using identified retention times. For unknown compounds the solutes are gathered individually and analyzed using another process, for instance mass spectrometry. For each compound in a mixture one peak is observed on the chromatogram. In the particular set of operating conditions relating to the column, the retention time will amplify through the size and polarity of the compound. To discover the concentration of a meticulous compound, the peak height should be computed. 2) The Pump System controls the flow and computes the volume of solvent (the mobile phase) the flow rates of HPLC columns are slow - often in the range of 0.5 - 5 cm3 min-1. 3) The Injector System: The model to be divided is injected into the liquid phase at this point. 4) The Column is made of steel and packed generally through porous silica particles (the stationary phase). Different materials can be utilized depending on the nature of the liquid. A long column isn't required since division in HPLC is extremely efficient. Columns are generally 10-30 cm long, through an internal diameter of 4 mm. Different components of the example are carried ahead at different rates via the moving liquid phase, due to their differing communications through the stationary and mobile phases. 5) The Detector: When the components accomplish the end of the column they are analyzed through a detector. The amounts passing through the column are small, so solutes are analyzed as they depart the column. Consequently HPLC is generally bonded to a spectrometer (for example ultra violet or mass spectrometry). The length of time it obtains for a compound to reach the detector permits the component to be identified. Similar to the GC, once the retention time of a solute has been established for a column using a meticulous set of operating conditions, the solute can be recognized in a mixture. A chromatogram is attained for the example. Thin layer chromatography is mainly helpful in forensic work, for instance in the division of dyes from fibres Gas Chromatography is utilized to analyse blood samples for the existence of alcohol. It is as well utilized to analyse samples taken from athletes to make sure for the presence of drugs. In each case, it divides the components of the mixture and specifies the concentrations of the components. Water companies test samples of water for pollutants using Gas Chromatography to divide the pollutants, and mass spectrometry to identify them. HPLC has many utilizes these as drug testing, testing for vitamins in food and increase promoters in meat. In each case components of the mixture are divided and noticed. Chromatographic separations obtain benefit of the fact that different substances are partitioned differently between 2 phases, a mobile phase and a stationary phase. In thin layer chromatography (TLC) the mobile phase is a liquid and the stationary phase is a solid adsorbent. TLC is a simple, convenient and economical way to find out how many components are in a mixture and, in many instances, can be used to identify the components as well. In thin layer chromatography, a solid phase, the adsorbent, is coated onto a solid support as a thin layer (about 0.25 mm thick). In many cases, a small amount of a binder such as 'plaster of Paris' is joined through the adsorbent to facilitate the coating. Many different solid supports are employed, including thin sheets of glass, plastic, and aluminum. The mixture (A plus B) to be divided is dissolved in a solvent and the consequential solution is spotted onto the thin layer plate near the bottom. A solvent, or mixture of solvents, termed the eluant, is permitted to flow up the plate via capillary action. At all times, the solid will absorb an assured fraction of each component of the mixture and the remainder will be in solution. Any one molecule will spend part of the time sitting still on the adsorbent through the remainder moving up the plate by the solvent. A substance that is strappingly adsorbed (say, A) will have a greater fraction of its molecules adsorbed at any one time, and therefore any one molecule of A will expend more time sitting still and less time moving. In compare, a faintly adsorbed substance (B) will have a smaller fraction of its molecules adsorbed at any one time, and hence any one molecule of B will spend less time sitting and more time moving. Therefore, the more weakly a substance is adsorbed, the farther up the plate it will shift. The more robustly a substance is adsorbed, the closer it will wait near the origin. Paper chromatography, which will be utilized to divide amino acids, is in fact a form of partition chromatography. Water, a component of the extending solvent, forms hydrogen bonds through the fibers of the paper and provides as the stationary phase. The organic liquids that are as well present in the developing solvent provide as the mobile phase. The components of the mixture are drawn up the paper to different heights, depending on their solubility in the mobile phase. The compounds that are more soluble in the organic liquid remain dissolved in the mobile phase longer than those that are less soluble and therefore travel further up the paper. Proteins, huge molecules found in all living organisms, serve a variety of functions in metabolism, these as catalysis, transport, storage, control of growth and immune protection. Amino acids are the building blocks of proteins. Every amino acid has an amino group, a carboxyl group and a distinctive side-chain. Nature uses twenty different amino acids to synthesize proteins. The four amino acids that you will separate by paper chromatography are alanine, leucine, lysine, and valine TLC is helpful since it is reproducible. For a particular adsorbent/solvent/compound combination, the ratio of the distance the compound travels to the distance the solvent travels remains constant. This ratio is termed the Rf value. While having the similar Rf value (under the similar conditions) doesn't prove that two substances are the same, having different Rf values express that they are different. In this experiment, we will divide several amino acids using paper chromatography. Amino acids are colourless compounds. In order to see the spots on the chromatogram, we will apply a solution of ninhydrin to the paper. Ninhydrin will react through the amino acid to generate a purple compound. Silica gel will provide as the stationary phase in the thin layer chromatography procedures. Finding a solvent or mixture of solvents that provides as an effective mobile phase is the most difficult part of TLC. Often numerous different combinations of solvents are tested before one is found that will separate the compounds of interest successfully. We will examine the consequence that different solvent systems have on the division of the pigments in food dyes. We will as well utilize TLC to identify the active ingredient in an over-the-counter medicine tablet. The tablet we will test encloses one of the subsequent: acetylsalicylic acid (aspirin), acetaminophen (the active ingredient in Paracetamol) and caffeine. As the amino acids, the medicine tablet ingredients will not be visible after the plate has been expanded. The spots will be illuminated whenever viewed under short-wave ultraviolet light. Several of the spots will as well transform colour when exposed to iodine vapours. Attain a sheet of 13 x 18.5 cm Whatman no. 1 chromatography paper. When we handle this paper, hold it only on one of the long (18.5 cm) sides, that will be considered the 'top' of the sheet. The amino acids from our fingers will contaminate the paper and lead to erroneous consequences if it is contacted on the 'bottom'. Lay the sheet of chromatography paper on a piece of notebook paper, and draw a line in pencil, not pen, 1.5 cm above the bottom. Make small marks along the line using the dimensions given in via our supervisor. Write labels at the top. Utilize the small capillary tubes presented to make 4 spots, one of each amino acid (alanine, leucine, lysine and valine), along the pencil line. Follow the labels written at the top of the sheet. Our supervisor will assign each of us an 'unknown' example that encloses one or more of these 4 amino acids. Spot this solution on the paper as well. For each spot we make, touch the capillary to the surface of the paper rapidly and flippantly so that the spot is approximately 2-3 mm in diameter. Permit the spot to dry, and then re-apply the solution at the exact same place, again touching the paper quickly and lightly. Permit the spot to dry, and repeat one more time. After all 6 solutions have been applied to the paper in this manner; allow the spots to dry for 5 minutes. Workings together, roll the paper into a cylinder through the spots on the outside, and then staple it so that the edges don't overlap or touch. Pour 50 mL of the amino acid expanding solution into a 1000 mL beaker. The developing solvent is consisting of a 4-to-1 mixture of 1-butanol and glacial acetic acid that has been saturated with water. Position the cylinder inside the beaker with the bottom edge submerged in the solvent. Make sure the paper doesn't touch the glass. Place a piece of aluminum foil over the mouth of the beaker. Allow the chromatogram to develop undisturbed for 60 to 75 minutes. Do not move the beaker while the chromatogram is developing! Whenever we eliminate the paper from the beaker, mark the solvent front through a pencil. Set the cylinder on notebook paper, and permit it to dry. When the chromatogram is entirely dry, eliminate the staples, and hang it from the clips in the fume hood. Wearing gloves evenly coat the paper using the ninhydrin spray. Don't allow the paper to become dripping wet. Place the chromatogram in an oven set at 80° for about 5 minutes. Circle the spots by a pencil. Calculate the distance from the origin to the center of each spot and the distance from the origin to the solvent front. Afterward, we will attach this chromatogram to our consequences and computations sheet. Attain 2 TLC plates through the dimensions of 5 cm x 6.7 cm. Draw a line in pencil, not pen, 1 cm from the bottom along the short (5 cm) side of each plate. Be watchful not to bother the silica gel as we draw such lines utilize the small capillary tube supplied to spot 4 spots, one of each colour, along the line drawn on each of the plates. When spotting a TLC plate, touch the capillary to the surface of the plate rapidly and lightly so the spot is extremely small. The spots will be extremely coloured because the food dye solutions are quite concentrated. Oftentimes it is necessary to re-apply a dilute solution to the spot (allowing the spot to dry in between applications) until the spots are highly coloured, however this will not be necessary in this case. Line a 250 mL beaker with a piece of filter paper. Place a small amount of the 3:1 isopropanol: concentrated ammonia developing solvent in the beaker. The liquid should cover the bottom of the beaker to a depth of about 0.5 cm; nevertheless, the level of the liquid must be below the line when the plate is situated in the jar (that is, less than 1 cm in depth). The filter paper lining will saturate the atmosphere within the beaker by solvent fumes. Fit a piece of aluminum foil over the mouth of the beaker. Place one of the plates that we have spotted in the beaker, cover it by the foil and permit the solvent front to shift up the plate until it is roughly 1 cm from the top (one hour maximum). Don't bother the beaker while the chromatogram is developing! Eliminate the plate and mark the solvent front by a pencil. Permit the plate to dry for a few minutes, and then circle any visible spots by a pencil. Into a filter paper lined 400 mL beaker, pour either pure isopropanol or 1:1 isopropanol: concentrated ammonia to a depth of about 0.5 cm. extends the second plate in the similar manner as the 1st using the chosen solvent. Mark the solvent front and circle the spots. Examine the chromatogram of someone who utilized the other solvent for his or her 2nd plate. Sketch diagrams of all 3 chromatograms in our notebook. Calculate the distance from the origin to the center of each spot and the distance from the origin to the solvent front for each of the 3 chromatograms. Attain a silica gel TLC plate through the dimensions of 6 cm x 6.7 cm. Draw a line in pencil 1 cm from the bottom along the short (6 cm) side of the plate. Be watchful not to bother the silica gel as we draw the line! Use the small capillary tube provided to spot 3 spots, one of each active ingredient solution (acetylsalicylic acid, acetaminophen and caffeine), along the line. Leave room for a fourth spot. Our supervisor will allocate a non-prescription medicine tablet for us to analyze. Spot our TLC plate through the supernatant from a mixture of this compressed tablet and methanol. When applying such solutions to the plate, touch the capillary to the surface of the silica gel rapidly and lightly so the spot is extremely small. In each case, reapply the spot, permitting it to dry in between applications, 2 more times. Situate a small amount of the ethyl acetate developing solvent in a 400 mL beaker. The liquid should cover the bottom of the beaker to a depth of about 0.5 cm. Line the beaker by a piece of filter paper to saturate the atmosphere within. Fit a piece of aluminum foil over the mouth of the beaker. Place the plate that we have spotted in the beaker, cover it by the foil, and permit the solvent front to shift up the plate until it is roughly 1 cm from the top. Don't disturb the beaker while the chromatogram is rising! In this case, the solvent will travel up the silica gel plate very rapidly and will reach the top in 2 to 3 minutes. Eliminate the plate and mark the solvent front by a pencil. Allow the plate to dry for a few minutes, and then observe it under short-wave ultra-violet light. Through a pencil, circle any spots that are illuminated. Write our initials in a corner of the plate, and situate it in an iodine chamber. Position the plate so that the silica gel surface is entirely exposed to the iodine vapors and isn't covered via other plates in the chamber. Depart it there for 5-10 minutes. After removing the plate from the chamber, record in our notebook whether or not any coloured spots appeared as a consequence of exposure to the iodine vapors. If new spots appear, circle them by a pencil. Sketch a diagram of the chromatogram in our notebook. Determine the distance from the origin to the center of each spot and the distance from the origin to the solvent front.